Before scientists apply new spacecraft measurements to global climate change research, they must carefully test their understanding of the data under controlled conditions. During April 2001, a team of 200 investigators from 11 countries participated in the Aerosol Characterization Experiment (ACE) field campaign in Asia, deploying instruments aboard several ships, aircraft, and island stations in the waters surrounding Japan and Korea. They characterized meteorological conditions, measured the atmospheric energy balance, and directly sampled airborne dust and pollution particles while the Multi-angle Imaging SpectroRadiometer (MISR) and other satellite instruments flew overhead. 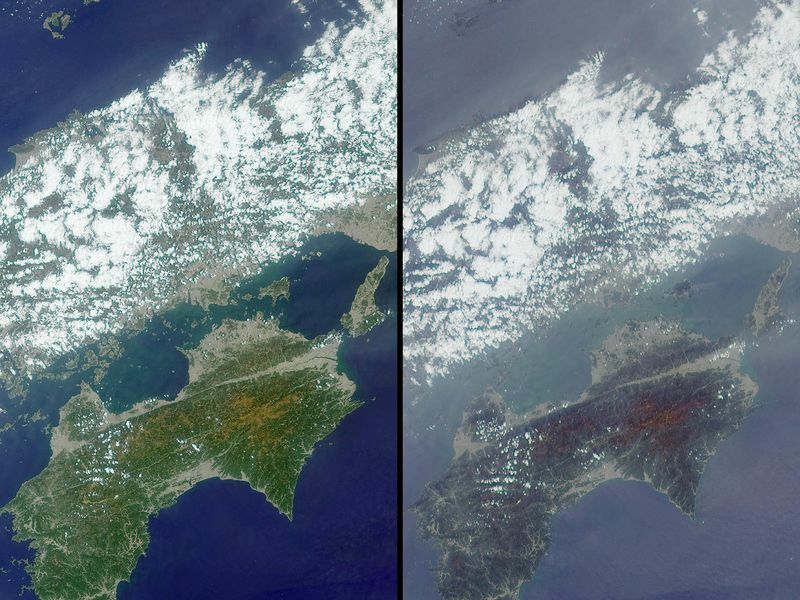 These MISR images, centered just north of Shikoku Island in southwest Japan, were acquired on April 13, 2001 during Terra orbit 7015. They are two of nine simultaneous views obtained at different angles by the instrument, at 26 degrees aft of vertical (left) and 60 degrees forward of vertical (right). 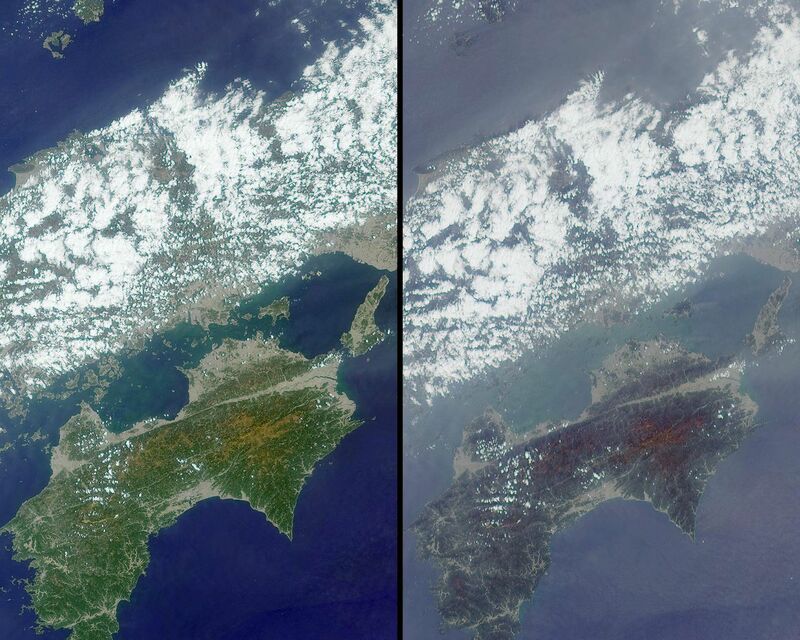 The entire west end of Honshu Island, which crosses the upper half of the images, is covered with broken clouds. Away from the clouds, the atmosphere looks hazier in the steeper MISR view; such differences reveal information about particles in the atmosphere. 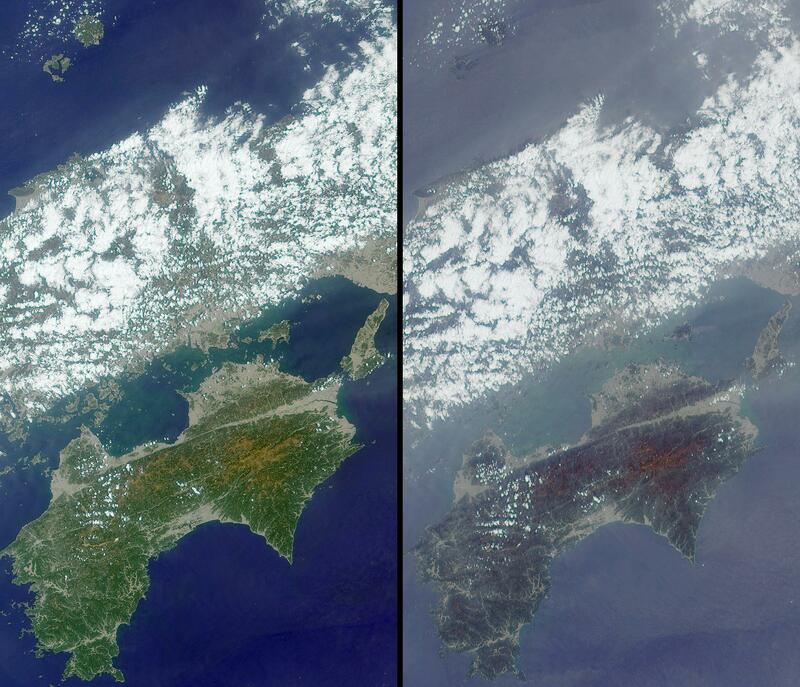 As these images were taken, the U.S. National Oceanographic and Atmospheric Administration (NOAA) Research Vessel Ron Brown and the National Science Foundation (NSF)/National Center for Atmospheric Research (NCAR) C-130 aircraft probed the environment near Oki island, in the upper left part of the images. 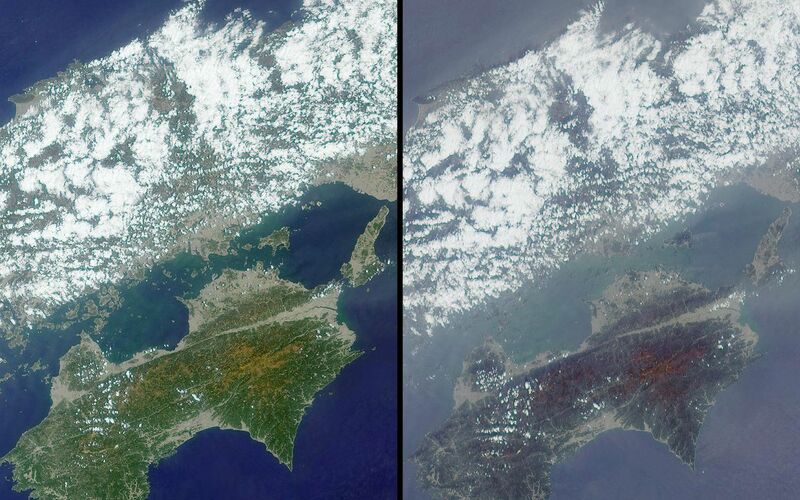 At the same time, the Center for Interdisciplinary Remotely Piloted Aircraft Studies (CIRPAS) Twin Otter aircraft made atmospheric chemistry and heat-balance measurements in the bottom-center region of the images.